If you are familiar with Japanese foods, when you think of okonomiyaki, you may think of Kansai (Osaka in particular). You'd be right in thinking this... 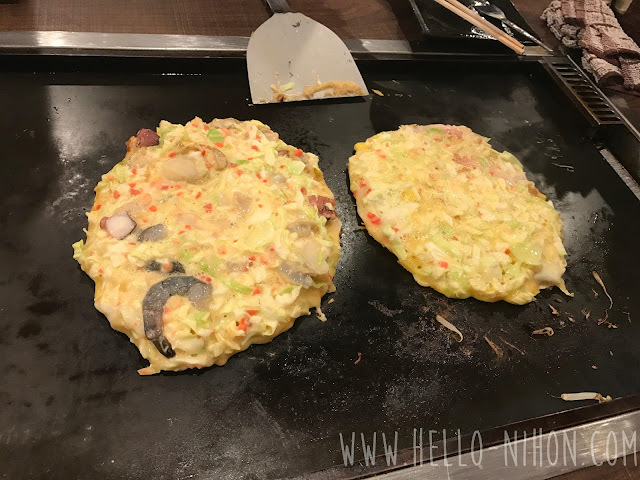 However, in recent times, okonomiyaki can be found everywhere! In fact, did you know that there are multiple styles of it? 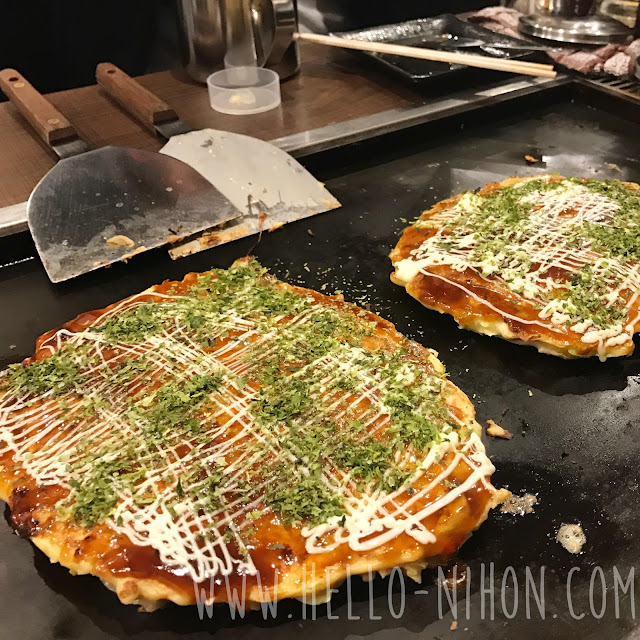 When I make okonomiyaki at home, I always make it Hiroshima-style because that way is my favorite. 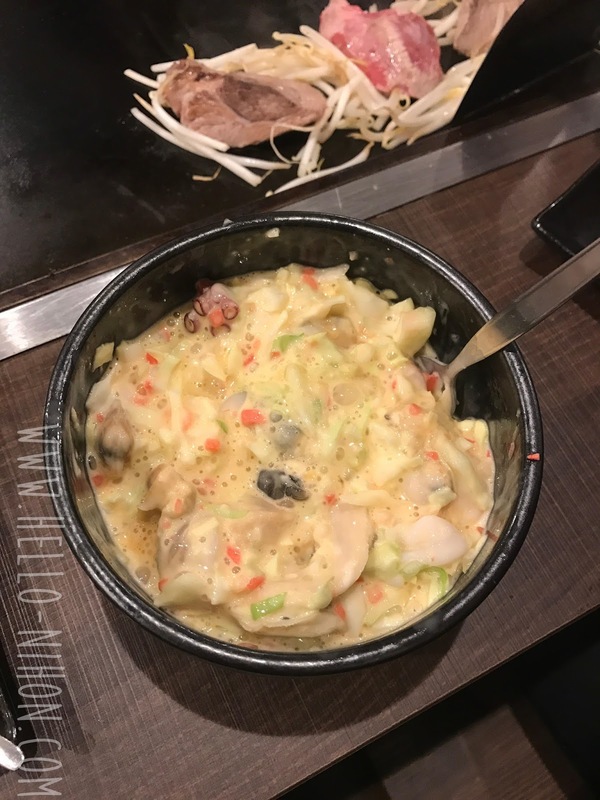 Hiroshima-style includes yakisoba noodles as a layer, which really gives it a nice extra texture. 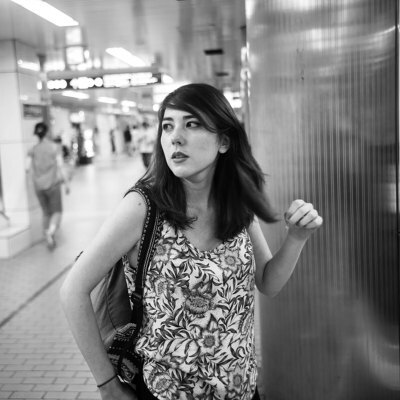 Actually, a majority of the people I talk to prefer Hiroshima-style to Kansai-style! 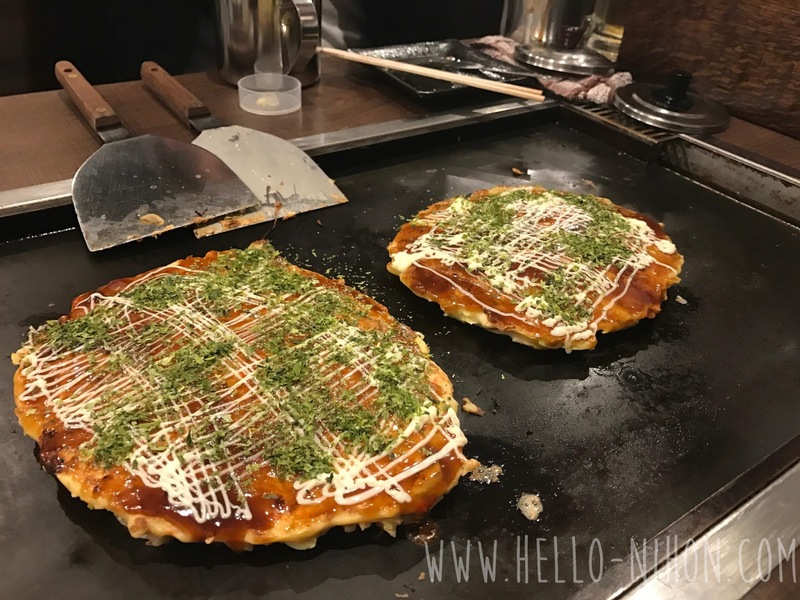 Now, when you think of Asakusa, do you think of okonomiyaki? No? Me neither! I think of temples and traditional Japan. 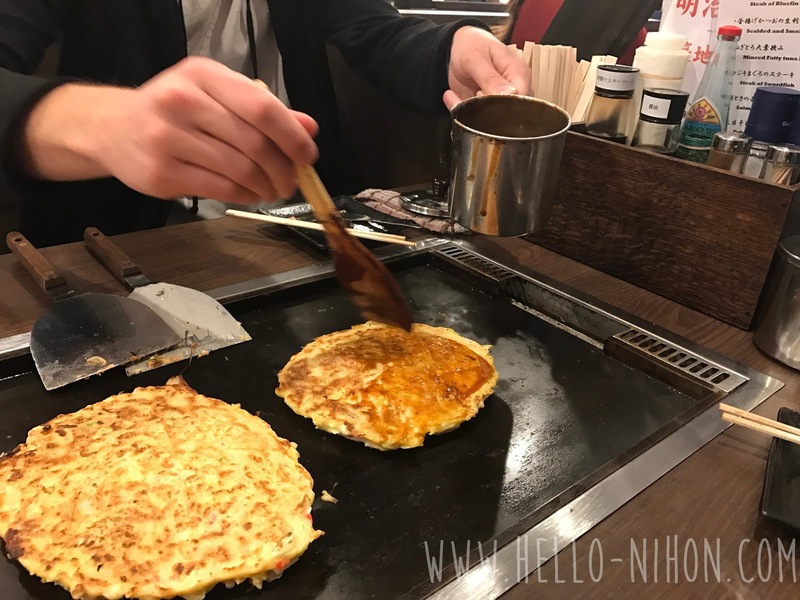 But I actually went to a really delicious okonomiyaki restaurant with my friends and had a good time making it at the table! 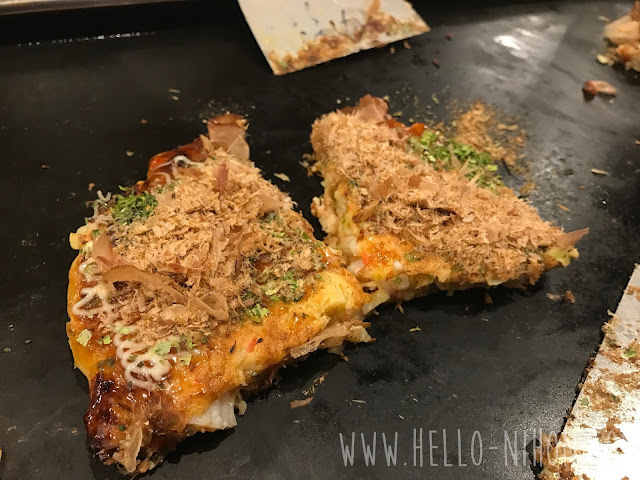 We went to Rokumonsen okonomiyaki restaurant and I totally recommend it! The prices weren't bad and the food was delicious. Each table was fitted with a teppan, or a hot steel plate, in the center of the table. 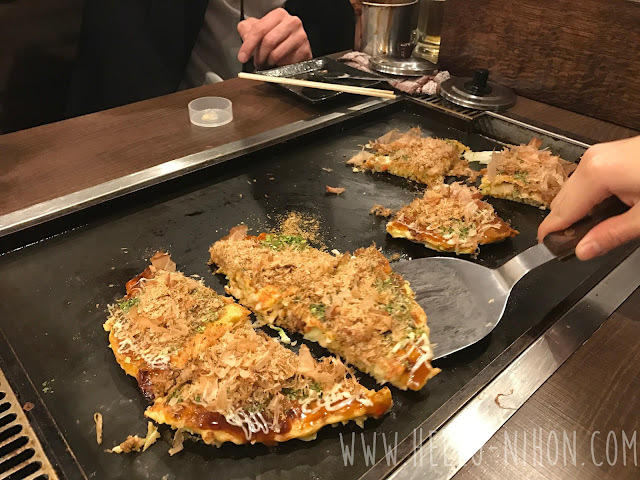 After choosing the types of okonomiyaki from the menu that we wanted, the ingredients were brought out to us. 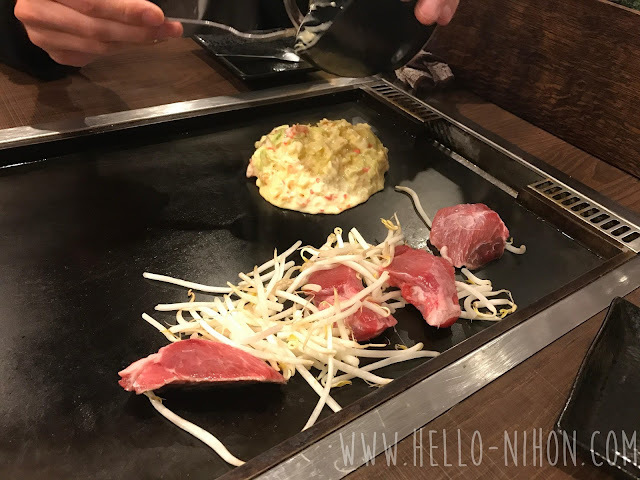 We started off ordering one appetizer of maguro (tuna) steak that came with bean sprouts. I thought it was to eat raw, but apparently I was mistaken! I guess when they give you a big grill on your table, they expect you to fry everything up! First, we started with two seafood okonomiyaki. Look at the variety of seafood that's in there! Shrimp, clams, scallops, octopus... Yum. You'll get your ingredients in a bowl. You need to mix them up yourself into a sort of paste. It may look gross now, but it'll taste delicious once it's all cooked! This is what it looks like after it's mixed. The batter is on the bottom of the bowl, so you really need to scoop around to get the seafood distribute evenly through the batter. You don't want uneven okonomiyaki! Next you're going to want to dump everything out onto the grill. 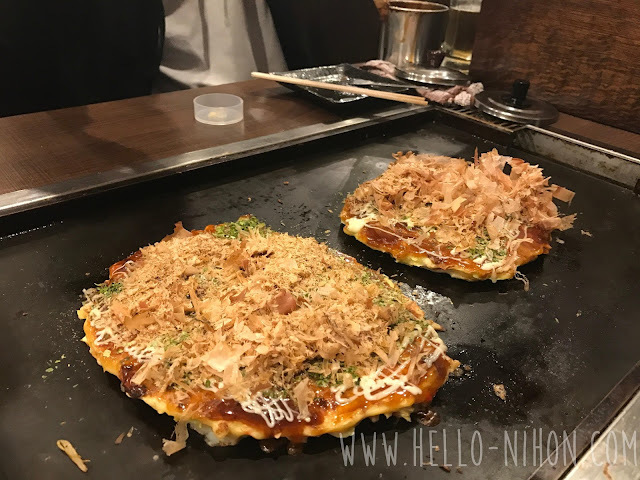 We opted for two smaller okonomiyaki because there were four of us and it was easier to eat that way. 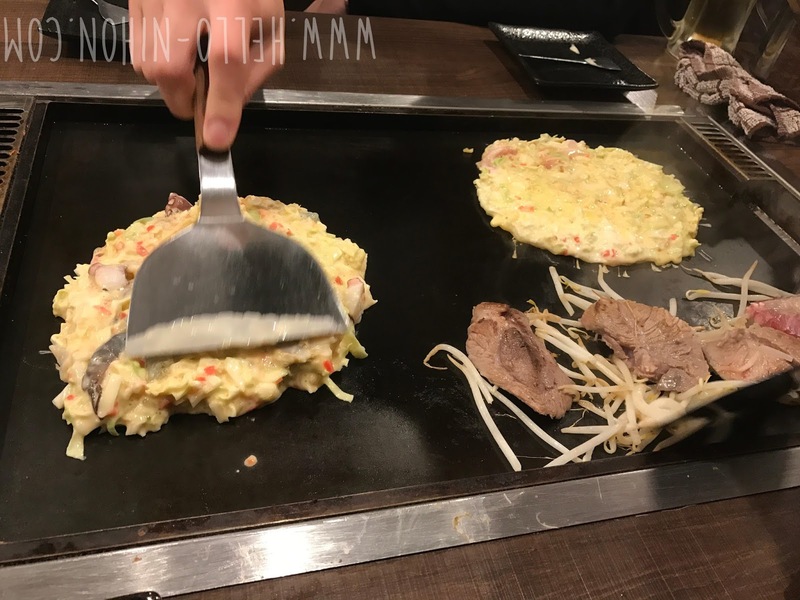 They include a spatula at the table which you're supposed to use to shape the okonomiyaki. They're supposed to be circles, but in theory I guess you could make them into whatever shape you wanted! 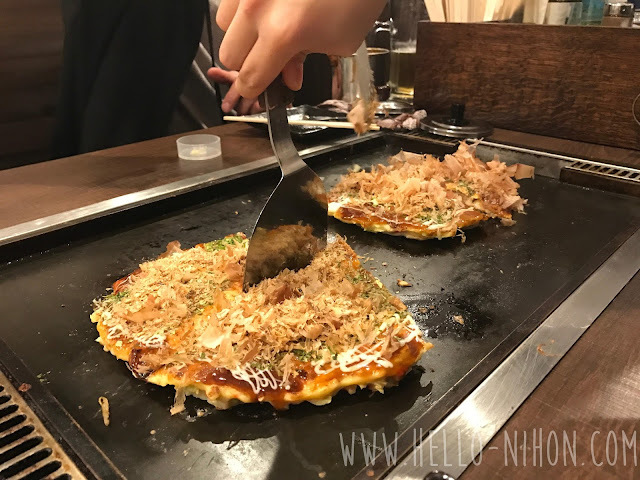 After you're confident that your okonomiyaki has cooked for long enough, you can flip it. You're probably going to need two spatulas for this (using one on each end to lift). There are containers of sauce at the table that you can use to coat your okonomiyaki. I like a lot of sauce, so I recommend being liberal with your application! After the sauce is on, you can add the mayonnaise and seaweed as the bottom of the food is cooking. Like the sauce, these are also located at your table, so you can apply as little/as much as you like. Again, as with the sauce, I recommend a liberal application for more flavor. Now it's my favorite part: time to add the katsuo (bonito) flakes. These delicious fish flakes look like they dance when the heat is turned up so they're really cool to watch! We actually ended up using all of the flakes in the container at the table, so we had to ask the waitress to bring us more. 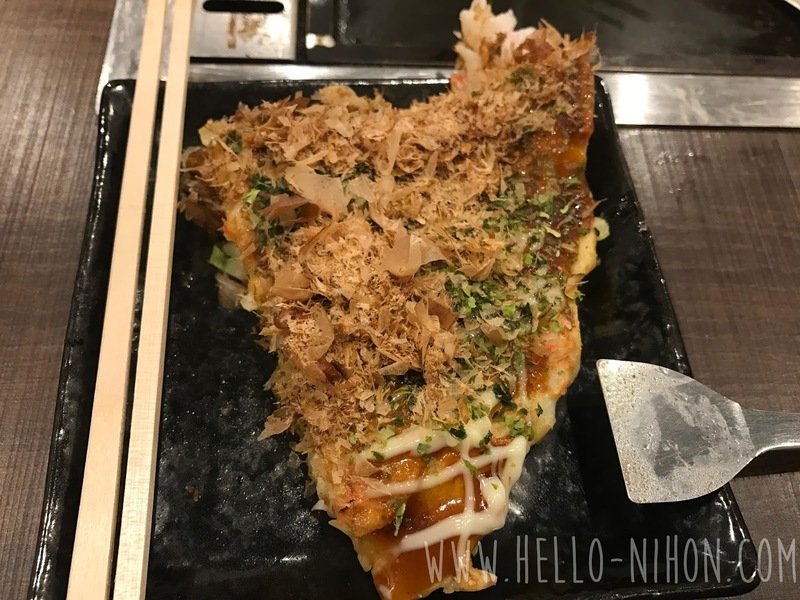 Yum, this is making me hungry just thinking about this place and looking at the yummy pictures. I can't wait to go back... Or should I try a new place? 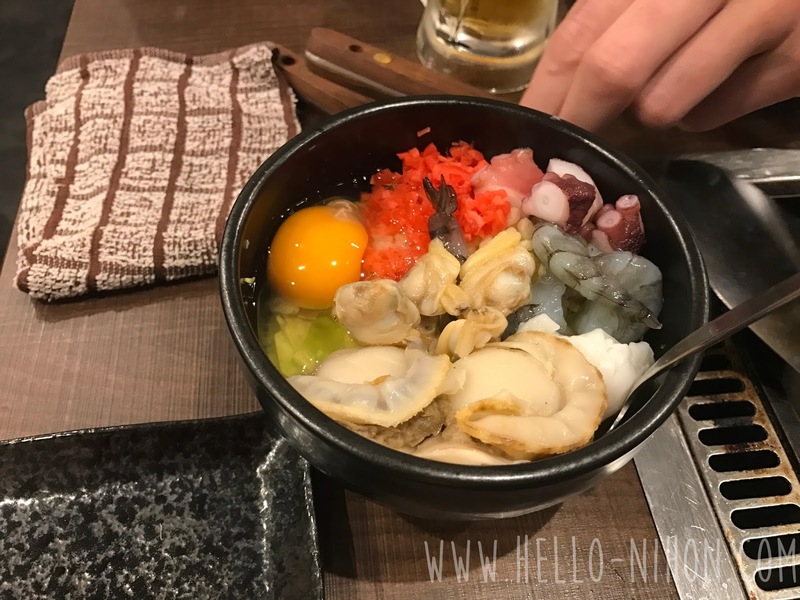 There are a lot near Asakusa's Kaminarimon. I guess I'll see how I feel next time!